One of the strangest arguments anti-immigration advocates make is that immigration proponents have Asperger’s Syndrome. What exactly is the substance (if there is any at all) of this criticism? A brief background in Asperger’s syndrome may be helpful before continuing. It is a mental condition characterized by difficulties in verbal and social communication, as well as a tendency to be overwhelmed by sensory stimuli. People diagnosed with it often have difficulty perceiving the feelings of others. However, people with Asperger’s generally have otherwise normal intelligence. In fact, they are often unusually good at abstract reasoning, ordering and organizing knowledge, and focusing their attention on a single subject of interest without distraction. Asperger’s is often considered a type of autism, but there is some debate on this topic. Steve Sailer’s brief blog post “Libertarianism is Applied Autism,” is one of the earliest examples of this argument. The main point he makes in this post is that libertarian economists do not realize that other people can sometimes behave violently. He argues that a good reason for one to embrace citizenism is that citizens will assist one another in fighting against the violent people in the world. Taken in this context, Sailer’s criticism is yet another iteration of the common “economist blind spot” attack. He is essentially arguing that people engage in a form of non-market interaction (violence), that anti-free-market solutions such as immigration restriction and citizenism are needed to deal with this fact, and that immigration advocates are blind to this fact. The only difference is that this time he is claiming that the cause of this blindness is the cognitive impairments caused by autism rather than the simplifying assumptions that economists make in their work. Other restrictionists have since made autism-related comments, but these do not really add anything new to Sailer’s original argument. They retain the essential claim that open-borders advocates suffer from a cognitive dysfunction that prevents them from understanding certain restrictionist arguments. This criticism is problematic in numerous ways. The most obvious one is that many open borders advocates do engage with the “non-economic” objections restrictionists make and devote time, effort, and research to addressing them. For instance, Bryan Caplan addresses the claims that immigrants generate political externalities and the claim that they contribute to crime. Nathan Smith addresses the “war” objection here and the “social capital decline” objection in great detail. John Lee also addresses many of these objections and finds them wanting in the face of the incredible good that open borders could do. And these are just a few examples. Open borders advocates do understand these particular objections, and do make serious attempts to address them. Furthermore, while it is true that open borders advocates do focus on the economic side of things, this is partly because it is simply the best researched topic. Economists have done serious analyses of open borders and how it might affect the economy, but criminologists and sociologists have not done the same level of thorough research in regards to its effects on crime and society. Open borders advocates have made serious efforts to research these “non-economic objections,” and what results on these topics they have found have been limited. Another problem with this criticism is that it is not clear that the common-sense, intuitive view of human behavior that a neurotypical person would have is more correct than economic research. The entire reason that economic research (and science in general, for that matter) is even done is that the human race’s common-sense view of how the world works is sometimes wrong. There is a very large amount of psychological literature focused on phenomena such as the “fundamental attribution error” and “ultimate attribution error.” These phenomena encompass the human tendency to incorrectly assume that a person or group’s innate disposition is the cause of their behavior, rather than external factors. If human beings are biased towards attributing human behavior to innate dispositions, rather than external factors, an economic model the focuses on external incentives may well be more accurate than a common-sense model that disregards them. A cynical reading of tendency of certain restrictionists to focus attention on innate factors like IQ is that they are attempting to find a way to salvage the fundamental attribution error. Another problem with using the intuitive view when addressing immigration is scope neglect. The human mind did not evolve to process the extremely large numbers of people that immigration policy deals with. For this reason it seems likely that addressing immigration policy with an abstract, scientific approach, is more fruitful than using our more intuitive systems for understanding other humans. Consider in particular the restrictionist tendency to focus on dramatic, frightening scenarios like crime, social pathology, and ethnic violence; and compare it to the open-borders advocate’s focus on economic deprivations. Also note that restrictionists sometimes seem to think that all they need to do is establish that these things could happen at all, rather than do a cost-benefit analysis of how likely they are to happen. This is strongly reminiscent of the human tendency to focus on dangers that make for scary stories (i.e. murders, shark attacks) instead of dangers that are common and likely to happen (i.e. car crashes, heart disease). A final objection to the “Asperger’s argument” can be found by considering what exactly it means to say that people with Asperger’s often “lack empathy.” The term empathy has two common meanings. It can mean the ability to perceive and notice other people’s feelings and desires (let us call this Empathy 1). And it can mean caring about other people’s feelings and desires (let us call this Empathy 2). To put it another way, Empathy 1 is about noticing the existence of other’s feelings, Empathy 2 is about caring about others’ feelings. The “lack of empathy” in “Asperger’s syndrome” is Empathy 1, people with Asperger’s have trouble noticing if someone is happy or upset, but if they do manage to notice they display normal human levels of sympathy. Many restrictionists, however (especially those of the “citizenist” bent), seem to be lacking in Empathy 2. They tend to see potential immigrants in terms of IQ statistics, standard deviations and collections of “social pathologies,” rather than as people. They lack much in the way of concern for the harm that immigration restriction inflicts upon others, particularly non-citizens. If Libertarianism is applied Autism then Citizenism is applied Antisocial Personality Disorder. If one is to go about associating a political position with a mental disorder, it would probably be wise to check to make sure one’s own philosophy can’t be easily associated with an even worse disorder. In light of this, it does not seem like the “Asperger’s argument” is a particularly valid criticism of open borders advocates. Open borders advocates understand and engage with the criticisms that restrictionists claim “autism” makes them overlook. Furthermore, it is not clear that the cognitive functions that Asperger’s and other forms of autism impair are necessary to understand the issues surrounding immigration policy. Finally, the project of associating political positions with mental disorders is probably not a wise undertaking in the first place. Here at Open Borders: The Case, we have devoted a large number of blog posts to critiquing citizenism. Some others on the open borders side have been critical of this resource allocation decision. One criticism is that by devoting so much attention to citizenism, we’re giving it more serious consideration than it deserves. This sentiment was echoed in a comment by Andy Hallman for instance. As a rule, I do not respond to positions that are neither plausible nor popular. So, is citizenism either plausible or popular? If we look at the explicit origins of citizenism, we might be tempted to think otherwise. The term “citizenism” has been coined by Steve Sailer, who, while doubtless considerably more widely read than Open Borders, is quite controversial himself, and hardly mainstream. The use of the term hasn’t caught on much outside a few select circles: Sailer’s ideological fellow travelers on the one hand, and a few other blogs such as Open Borders and EconLog on the other. I believe that even though few people explicitly subscribe to the tenets of citizenism as formulated by Sailer, most restrictionist arguments, particularly those that refer to the harms to immigrant-receiving countries, implicitly make their normative claims using citizenist reasoning — they weigh the interests of natives/citizens much higher than that of non-citizens, and view this as a legitimate basis for immigration restrictions. Citizenism is an important undercurrent in the majority of restrictionist thinking and perhaps even in some mainstream pro-immigration circles. Citizenism, the idea that national governments and citizens should give primacy to the interests of current citizens (and their descendants). Citizenism may be justified by neocameralism or some variant thereof. Territorialism, the idea that national governments should give primacy to the interests of people within the geographic area of the nation-state, regardless of their citizenship status. Local inequality aversion, the idea that local inequality within national boundaries is an evil in and of itself, independent of global inequality. Nation as family, a variant of citizenism which asserts that the family is a useful metaphor for the nation, and that the head of family is the nation-state’s government. “Maximize the average” type views, where the goal is to maximize the average indicators of the nation as it is constituted in the future, through appropriate migration, deportation, and extermination policies. Love for the physical land or specific cultural capital of the nation-state as a motivator for national government policy, independent of whether people are willing to pay to preserve these. “Proposition nation” theories: Here, the goal is to preserve specific values or institutions associated with the nation, such as slavery, ethnic strife, democracy, free markets, or a large welfare state. All of these are important and they interact in interesting ways, but I contend that citizenism is one of the more important formalizations of the moral relevance of countries. Later in the post, I will return to the question of why it isn’t more explicitly embraced or discussed in mainstream circles, and why it took a relatively heterodox figure like Steve Sailer to articulate it clearly. I would guess that it remains the common sense assumption of 90 per cent of British citizens that public policy should give preference to the interests of citizens before non-citizens should the two conflict: that does not mean you cannot be an internationalist, or believe that it is a valuable part of our tradition to offer a haven to refugees, or believe that all humans are of equal moral worth and if they are in British space are entitled to certain basic rights. But it does mean that the first call on our resources and sense of obligation begins with our fellow citizens. And this should be a central principle underlying immigration policy that the authors do not spell out robustly enough: immigration policy must be designed to serve the interests of existing British citizens, especially poorer ones. [see also our master race page] It is true that it is not always easy to work out what those interests are. It is also true that Matt and Sarah do accept discrimination on grounds of nationality (and reject post-national arguments in favour of global social mobility) and understand that immigrants do not necessarily have the same entitlements as the settled population, but this is all rather tentative and overshadowed by a far more robust and often repeated commitment to a human rights ideology that too often overtly seeks to dissolve the precious distinction between citizen and non-citizen. This is a guest post by Bryan Caplan. Caplan’s previous guest post, My Path to Open Borders, has been one of the most viewed and most liked blog posts on our website. For the SS Man, one principle must apply absolutely: we must be honest, decent, loyal, and comradely to members of our own blood, and to no one else. What happens to the Russians, the Czechs, is totally indifferent to me. Whatever is available to us in good blood of our type, we will take for ourselves, that is, we will steal their children and bring them up with us, if necessary. Whether other races live well or die of hunger is only of interest to me insofar as we need them as slaves for our culture; otherwise that doesn’t interest me. Whether 10,000 Russian women fall down from exhaustion in building a tank ditch is of interest to me only insofar as the tank ditches are finished for Germany. We will never be hard and heartless when it is not necessary; that is clear. We Germans, the only ones in the world with a decent attitude towards animals, will also adopt a decent attitude with regards to these human animals; but it is a sin against our own blood to worry about them and give them ideals, so that our sons and grandchildren will have a harder time with them. When somebody comes to me and says, I can’t build tank ditches with children or women. That’s inhumane, they’ll die doing it. Then I must say: You are a murderer of your own blood, since, if the tank ditches are not built, then German soldiers will die, and they are the sons of German mothers. That is our blood. That is how I would like to indoctrinate this SS, and, I believe, have indoctrinated, as one of the holiest laws of the future: our concern, our duty, is to our Folk, and to our blood. That is what we must care for and think about, work for and fight for, and nothing else. Everything else can be indifferent to us. Sailer repeatedly appeals to citizenism to reject open borders. Though I think he’s totally misguided, I would never equate him with Himmler. I wouldn’t approvingly quote Sailer if I thought otherwise. I mean this in all sincerity, and do not mean to damn with faint praise. To condemn all citizenists because someone kills in the name of citizenism is pure guilt by association. Homicidal maniacs have yet to find a political philosophy they cannot twist into a rationalization for their crimes. So why bring Himmler’s speech up at all? Because this particular homicidal maniac appears to correctly deduce his criminal actions from citizenism. Himmler embraces absolute devotion to “the best overall interests of the current citizens of Germany” as the highest morality. In consequence, we can politely but firmly ask mainstream citizenists for clarification. Precisely how does Himmler misapply your political philosophy? Himmler is misapplying citizenism because the actions he defends were ineffective or counter-productive means to advance German interests. This story has the implausible implication that Himmler would have been right if the policies he advocated did in fact tip the scales of victory to Germany, leading in turn to a higher standard of living for Germans than we’ve actually observed. Himmler is misapplying citizenism because many of the people he wanted to murder were German. This story has the implausible implication that murdering non-Germans was OK. Furthermore, Himmler could reply that any so-called “Germans” he wants to murder lost their German citizenship years earlier. Himmler is misapplying citizenism because the doctrine only applies to Americans. While Americans should favor fellow Americans, Germans should not favor fellow Germans. This story has the implausible implication that it would have been morally permissible for Americans to work Russians, Czechs, and other foreigners to death if it had promoted American well-being. The Jewish nation will be rooted out, says every Party Comrade, that’s quite clear, it’s in our program: shutting the Jews down and out, rooting them out; that’s what we’re doing. And then they all come along, these 80 million good Germans, and every one of them has his decent Jew. My best guess is that avowed citizenists will flock to something like #4. I hope they do. But I still have to ask them: Given the horrific actions that people like Himmler have explicitly committed on citizenist grounds, why don’t you calm our fears by fleshing out the crucial qualifications that the Himmlers of the world fail to grasp? Why don’t you go further by naming some actually-existing American policies you oppose even though they’re literal implications of citizenism? If citizenists want their position taken seriously, they should start pre-emptively defending their positions from misinterpretation, even if it does tax their patience. 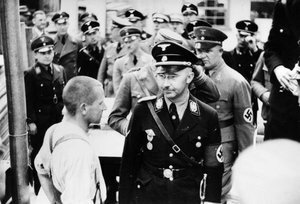 The photograph of Heinrich Himmler visiting Dachau concentration camp featured at the head of this post originates from the German Bundesarchiv, and is licensed under a Creative Commons Attribution-Share Alike licence. Will Natives be Blamed for Lack of Immigrant Success? In a short post, Steve Sailer manages to both make a potentially true and not really relevant point about how some people respond to the “lack of success” among immigrants (Vipul Naik blogged about another of Sailer’s comments that were also along these lines). Sailer points out an article that argues that even high performing schools fail Latino students. Though he doesn’t explicitly mention immigration there is a point that can be made here. Namely, when do we stop saying that the problem is a native institution and the problem is the immigrant? Surely saying that immigrants have no agency in their own success or failure and are only shaped by institutions is wrong. After all, Asian students, many of whom are immigrants or the children of immigrants themselves and coming from linguistic and cultural backgrounds that are more distant than the average Hispanic child, do very well. Of course, the problem could be a system set up that is specifically designed to fail Latinos but not Asians. That would depend upon the specific policies of the school. But even then a point could be made that redesigning the best schools for Latinos benefit could ruin what works for the rest of the student population. Thus if even the best schools fail to pull Latinos up the problem may not primarily be on the side of native institutions. This relates to a broader problem of natives being blamed for the lack of immigrant success. There are a few points I’d make in this regard. First off, to those saying that if immigrants or their children don’t achieve parity with natives that there is a major problem, I think that view suffers from a problem my co-blogger Nathan Smith has discussed, the use of borders as a blindfold. Specifically, comparing immigrant success to native success is the wrong metric to use. Most low-skill immigrants come from countries and backgrounds which produce far poorer results in terms of education and income (even crime though immigrants may not under perform natives in that category). The real metric to use isn’t a comparison to natives, against whom they will likely under-perform for a variety of reasons beyond the failure of natives to accommodate, but a comparison to the outcomes they were achieving in their home country. Results here tend to show immigrants far exceed what results they might have gotten in their native countries. This complaint is ultimately a problem of local inequality aversion and territorialism. The fact that individuals are better off than they were before and that global inequality is reduced is already a huge benefit to the world. This is related to the problem of compositional effects, where the average success of both sending and receiving countries can conceivably drop while still achieving a Pareto-improving outcome. We don’t need immigrants to match natives in results to make the world a far better place through immigration. As I’ve posted about before, we shouldn’t make local equality with natives a precondition for enabling people to make their lives better. Can local inequality cause dissent? Potentially yes, though such issues are not so terrible as to necessitate banning immigrants from a country. Riots such as those that happened recently in Sweden may in part be due to local inequality (the fundamental causes still cause some dispute), but if so this may relate more to a change in inequality than absolute inequality as Sweden has had large increases in income inequality recently, but remains far more equal than most OECD countries. If the varying levels of skill and productivity immigrants and their descendants bring does cause some unrest, that is likely to be transitory. For instance, the United States didn’t see increasing violent crime in general during the major late 19th century immigration waves, and if anything immigration seems to be a factor in decreasing crime rates. If immigrant-induced inequality causes unmanageable amounts of discontent we should notice this is overall crime not simply in big flashy riots. So no, the complaint that we need even our best schools to bend over backwards to create local equality isn’t a necessary idea for open borders. Outright hostility to immigrants isn’t justified (and that would be something to legitimately blame natives for doing), but at the same time if immigrant groups simply have less skills, productivity, or academic achievement that should not be automatically assumed to be the fault of natives. But will some groups still denounce natives if immigrants fail to match native outcomes without unfair discrimination being a major cause? Quite probably. For me however, I have to respond with a big “so what”? If such statements make a native upset, it is ridiculously easy to avoid in the modern media environment. Indeed, avoiding alternative view points might be something of a problem nowadays, but it does mean that it’s easier to avoid unfair complaints. However, to the extent people can’t avoid this though the effect might even be beneficial from Steve’s point of view. The end result may be average natives finding those who blame them for immigrant problems (or “problems” considering the gain immigrants get compared to where they came from) to be distasteful and oppose their policy prescriptions more. Social integration isn’t a bad thing when it happens, and ideally natives shouldn’t deliberately act to exclude immigrants from society. And it can be unfortunate when the second and third generations of immigrant families feel excluded or like they don’t measure up. But I doubt even in the worst cases of feeling excluded many would wish their families still lived in poverty in the developing world. Even when adjusting for inequality, one of the most unequal countries in the OECD, the United States, is still a healthier, wealthier place to be than any major immigrant sending country. If the angst of not being fully integrated into a broader society is less than ideal, it’s also much better than being in a Starving Marvin situation. Not to mention that one of the beauties of open borders is a greater chance for everyone to find the kind of culture or society that works for them. A position long held by Steve Sailer is that citizenism is ” the least destructive and most uplifting form of allegiance humanly possible on an effective scale.” Long term readers of this blog might guess that many of the bloggers here would tend to disagree. But here Sailer argues that of our options, we aren’t going to get better than citizenism. Given the options he presents, I might be hard pressed to say that citizenism is any worse than those options and it is clearly superior to many of them. “Personal feelings of moral superiority” for instance seems to devolve simply into straight egoism. Meanwhile the other options have problems of either arbitrariness or stifling of diverse ideas. But is universalism, namely the idea that all humans should carry equal moral weight to each other, truly not possible on “an effective scale”? The Most Uplifting Form of Human Allegiance is licensed by Chris Hendrix under a Creative Commons Attribution 3.0 Unported License.